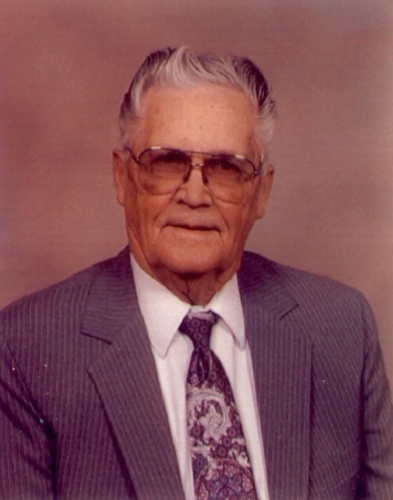 Lilburn D. Forest, age 85, of El Dorado Springs, Missouri, passed away at his home on December 8, 2011. He was born February 13, 1926, to Lester and Laura (Beydler) Forest near Jerico Springs, Missouri. L. D. grew up in the Jerico Springs area attending grade school in that area and high school in El Dorado Springs. He joined the US Navy in 1945, serving in Guam and Okinawa. He returned from military service in May of 1946 and married Thelma Marshall on November 16, 1946. L. D. and Thelma enjoyed 65 years of marriage and to this union two children were born: Gary Kent and Kelly Dawn. Beside his wife and children L. D. leaves behind five grandchildren: Amy Hedrick and husband Lance, Abby Floyd and husband Trent, Brandon Esry and wife Shannon, Kensey Paxson and husband Richard, and Kassy Wynes and Tommy Mansell; nine great-grandchildren: Nick and Bentley Allison, Gracen Floyd, Paige and Ian Esry, Kenley Widener, Kylee Walker, Alandah Wynes, and Jacey Swopes; daughter-in law, Kay Forest; step great-granddaughters Kaitlyn and Kara Hedrick; and honorary great-grandchildren: Taihlor Baldwin, Michaela Mansell and Alexus Mansell. L. D. grew up in a family of five brothers and one sister; brothers Harry Forest and Charles W. Forest survive residing in the Joplin, Missouri area. Preceding him in death were his parents, Lester and Laura; siblings: Hazel, Wayne, Daryl and Sam; nieces: Judy Beth Modglin and Jana McNowin; and nephew Darren Forest. L. D. spent his life working and raising his family in El Dorado Springs. Among his occupations were used car salesman, small business owner, and farmer. His most loved work through the years was on the farm with his cattle and horses. He was so proud of his white Charolais cattle and his team of Belgian horses. He loved the flashy walking horses and loved going to the farm to watch Gary’s horses and colts. L. D. loved his family and always watched out to protect them—one of his last concerns was all the little children in the family. He had a special interest in providing the grandchildren and all the great-grandchildren their first tricycle and was like a man on a mission to be sure he shopped and provided that first tricycle. L. D. loved the local country music shows and he and Thelma didn’t miss many; you could often find him at one of the local coffee shops—he always enjoyed the local chatter and sharing a few laughs and stories with friends. He was a member of the El Dorado Springs First Christian Disciples of Christ Church and attended there faithfully until his health declined. He will be missed and lovingly remembered by his family and friends. Services for L. D. Forest were held on Sunday, December 11, 2011, at 2:00 p.m. at Bland-Hackleman Funeral Home with Rev. Brent Bland officiating. Kassy Wynes provided music. Interment followed in El Dorado Springs City Cemetery under the direction of Bland-Hackleman Funeral Home. Pallbearers were Dave Forest, Neale Forest, Rick Forest, Wayne Forest, Jr., Mark Forest, and Daryl Wayne Forest. Honorary pallbearers were Mack Forest, Doug Forest, Greg Forest, and Johnny Forest.